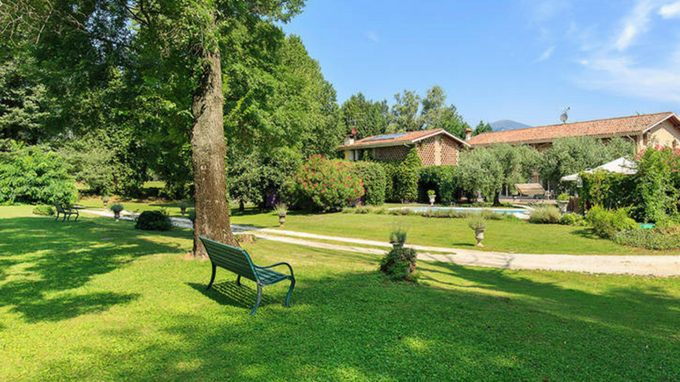 This stunning, elegant farmstead for sale in Franciacorta is right in the heart of Franciacorta's natural park, close to beautiful and enchanting high-quality vineyards. A spectacular driveway leads us from the the main gate to this private villa, located in the heart of a protected natural park measuring 5.5 hectares and home to olive trees, three natural lakes, a five-a-side football field, a private golf course with 4 greens and several paths, and a heated swimming pool near the villa. This property is divided into three buildings and has been finely renovated in a Provençal style by a famous French architect. The main body measures 530 m2 overall, the villa's entrance is through a living room inside a bright orangerie. On the upper floor there is another living room with a fireplace and original cotto-tiled floors, it is home to three en-suite bedrooms. The ground floor features a beautiful brick kitchen, a living room with a majestic fireplace, connected to another two independent buildings, a 120 m2 outbuilding for guests, an 80m2 apartment for staff – both with cotto-tiled floors – exposed beams and two stunning fireplaces in a Provençal style. It is also possible to buy permits to plant DOC Franciacorta vineyards and produce “bubbles”, transforming this property into a small wine-producing company for excellent sparkling wines. This farmstead is in one of Italy's most renowned areas, famous for its wine and sparkling wine in particular; it is also a short drive away from this region's main attractions. This high-quality estate framed by the stunning landscape offered by Northern Italy is for sale. In the Como area, there is this historical property for sale. It is in a hilly position just a few kilometres from Como's city centre.